On June 9, 1952, Fred Ross knocked on the door of a modest house on San Jose’s eastside. The house belonged to Cesar Chavez, then an anonymous 25-year-old struggling to support his family through part-time work at a lumberyard. Ross launched into his pitch, talking about how Mexican Americans could become a political force, but Chavez was initially skeptical. The episode was vintage Ross. As an organizer, he spent his life knocking on doors and breaking down barriers, encouraging and training people to stand up and fight back. A few years after taking Chavez under his organizing wing, Ross came across Dolores Huerta, then a single mother who planned on a career in teaching. After meeting Ross, Huerta launched into a lifetime of activism, and later helped Chavez do what everyone said was impossible: organize farm workers. Ross soon became Chavez’s organizing mentor, and for the next decade they crisscrossed the state of California, forming chapters of the Community Service Organization (CSO), the most powerful Mexican American organization of its day (at the height of the McCarthy era, no less). 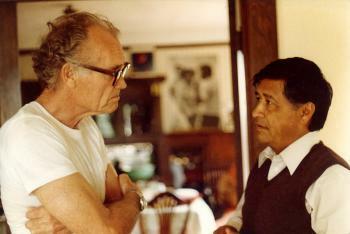 Although Ross was one of the most influential grassroots organizers of the twentieth century — mentoring individuals like Chavez and Dolores Huerta, running the Dustbowl migrant camp fictionalized by John Steinbeck in The Grapes of Wrath, securing the release of Japanese- American internees during World War II, organizing black and Latino parents to help end school segregation in California, going on to spearhead a campaign that elected the first Latino to Los Angeles’s city council since the 1800s, and strategizing with Saul Alinsky — he remained largely in the background, unknown to the general public. As Ross was fond of stating, “An organizer is a leader who does not lead but gets behind the people and pushes.” He spent his life pushing people to lead — in migrant camps, in living rooms, on picket lines — and was so effective that he pushed himself right out of most history books. Ross was born in San Francisco on August 23, 1910. His parents, both politically conservative, moved to Los Angeles soon after, where Ross grew up in the sheltered middle-class neighborhood of Echo Park. His first contact with the world of left-wing politics came at the University of Southern California, where he enrolled in 1932 and became close friends with a student named Eugene Wolman. Wolman was a dedicated unionist and Communist who traveled to Spain to fight against the fascist regime of Franco as part of the Abraham Lincoln Brigade. His courage, and death on the battlefield, would serve as a lifelong spur to Ross, who graduated from USC in 1936 and, unable to find a teaching job during the Depression, became a relief worker. After three years of relief work, Ross became manager of the federally-run Arvin Migratory Camp, located near Bakersfield. Arvin was home to hundreds of desperate dustbowl refugees, and was the camp fictionalized by John Steinbeck in The Grapes of Wrath. The former camp manager had been tossed out after residents accused him of numerous acts of violence, and Ross’ first duty was to restore their confidence. Arvin served both as a key training ground and political education for the future organizer. Ross learned how to gain people’s confidence, organized an elected council responsible for making many of the day-to-day decisions within the community, and supported a strike of cotton workers. It was at Arvin that Ross also came to know Woody Guthrie, who visited frequently and sung for the striking workers. When the U.S. entered World War II, Ross shifted positions to the War Relocation Authority, and spent most of the war years in Cleveland, seeking jobs and housing for Japanese-Americans, which allowed them to be released from internment camps. After the war he returned to Southern California to help establish multi-racial “unity leagues” as an organizer with the American Council on Race Relations. Organizing African-American and Latino parents in the citrus belt, Ross led voter registration efforts—which tossed out a racist politician in Riverside, and helped integrate schools. His work fed into the first successful federal school desegregation case in the country, Mendez vs. Westminster — which occurred seven years before Brown vs. Board. It was during this period that Ross discovered what would be his life’s major work: organizing Mexican Americans in California. Hearing of Ross’ exploits, Saul Alinsky hired him in 1947, marking the beginning of a long partnership. With funds secured by Alinsky, Ross spent the next decade serving as a key catalyst to the birth of Latino political power in California. He formed the Community Service Organization (CSO) with Edward Roybal, directing a groundbreaking voter registration drive in East Los Angeles that resulted in the election of Roybal to city council in 1949 — the first Latino council member since the 1800s. Using this success as a springboard, Ross spent the 1950s visiting barrios across the state, helping to form 22 chapters of the CSO. The CSO helped crack down on public brutality; registered half a million Latinos to vote; passed statewide legislation to grant pensions to 50,000 non-citizen farmworkers; and elected a number of leaders to local political office. The people who came out of the CSO — like Chavez, Huerta, and many others — would go on to play pivotal roles in the United Farm Workers and Chicano civil rights movements of the 1960s. After leaving the CSO in the early 1960s, Ross helped organize residents of Guadalupe, Arizona— home to both Mexican-Americans and Yaqui Indians—resulting in the group securing paved roads, stop signs, and other basic necessities from politicians who had long ignored their concerns. He then moved east for two years, where he taught organizing basics to students at Syracuse University. By now he had developed his own method, which relied heavily on a “house meeting” strategy that uses intimate living room gatherings as a means to build a broad organization. The campaign in Syracuse, funded through federal “War on Poverty” money, sought to organize African-American residents living in decrepit public housing. The Syracuse project soon generated national controversy — here was the government, after all, paying organizers to stir up protestors who then challenged government policies — and funding was soon pulled. Ross returned to California in 1966. By this time, Chavez and the farmworkers were locked in what likely amounted to a do-or-die struggle with the Teamsters over who would represent workers at DiGiorgio, a giant grower in the San Joaquin Valley. Ross was tasked with leading the election drive, in what amounted to a coming home affair: the cotton pickers who went out on strike at Arvin in 1939 — and were crushed with violence — had been DiGiorgio employees. Ross worked around the clock with a team of organizers to defeat the much wealthier Teamsters, who had the tacit support of the company. Ross would go on to spend the late 1960s and 70s assisting Chavez and the UFW with various elections and boycotts, training thousands of UFW volunteers in his organizing strategy. The list of Ross trainees is long and impressive, including Eliseo Medina — until recently a top leader of SEIU and now a key advocate for immigration reform — and Marshall Ganz, who helped design Barack Obama’s 2008 field campaign. Ross, married twice and with three children, continued to organize into the 1980s, conducting trainings for a wide array of groups that tackled everything from U.S. intervention in Central America to nuclear disarmament. His final organizing project was with Neighbor to Neighbor, a group headed by his son, Fred Ross, Jr., which successfully pressured the Congress in 1987 to cut U.S. military aid to the Contras in Nicaragua. Thompson is an author and journalist who’s work appears regularly in The Nation and has written for the New York Times, MotherJones, ColorLines, amongst others.